Talking loudly during a relatively quiet show is a form of oppression that, eventually, demands revolution. 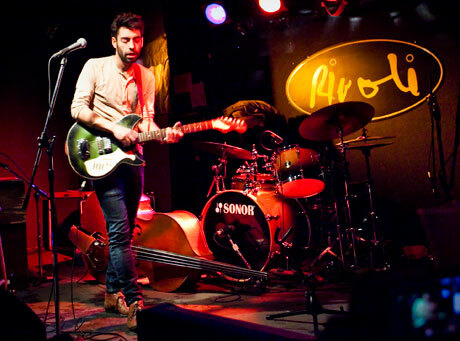 Beginning solo, Montreal singer-songwriter Leif Vollebekk contended with a divided crowd. Armed with just a guitar, he delivered what could have been a stirring rendition of "From the Forth," were it not for the overpowering clamour. Things improved when his full band stepped up. Incidentally, never underestimate the power of a saxophone. Alt-country builder "Off the Main Drag" injected a Sexsmith-ian number with plenty of fervour and standout "Cairo Blues" showed off the outfit's impressive chops. "Takk Sömuleiðis" was the most enthusiastic cut of the night and featured some stellar harmonica work. Throughout, Vollebekk himself was affable and undeterred, and, by the finale, he had drawn in most of the crowd. Thus, outliers got a spirited "shushing." Ultimately, it was a grower of a gig from a Starbucks-ready talent.